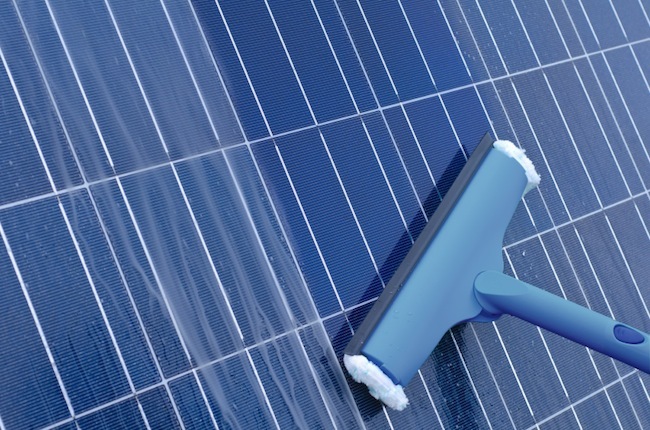 B&B Janitorial Services is here to help you with your solar panel cleaning needs! In addition to providing professional and affordable commercial janitorial services, B&B Janitorial Services is proud to offer industrial cleaning for solar panels. Our experienced and professional janitorial team safely and effectively cleans solar panels to ensure they are working and looking their best. Overtime, dirt, pollution, bird droppings, and other debris can cause your solar panels to lose as much as 25-30 percent of electricity production, according to the National Renewable Energy Laboratory. With our solar panel cleaning service in Los Angeles County, we’ll properly clean your panels to ensure maximum energy production. Rest assured, we don’t use harsh chemicals or abrasive scrubbers, which can damage your solar panels. Although durable, solar panels require general maintenance, such as cleaning, to protect their renewable energy performance. With the proper maintenance, your solar panels will offer a lasting service when cleaned regularly. You’ll no longer have to worry about debris blocking the radiation from the sun, causing to lose up to 20% of energy! We understand that cleaning solar panels can be risky business, which is why our professionally trained staff take the industry standard safety measures for the proper protection. In addition, as a qualified solar panel cleaning company, we use the best cleaning products and techniques to ensure the job is done right the first time, and every time. No matter if you have a few roof top panels or a large solar energy system, our professional and highly trained staff have a proven track record of success. You’ll be in good hands as we work to fully meet your needs and expectations while saving you money on your solar panel cleaning costs. Protect your Green Energy investment with the best solar panel cleaning service in Los Angeles County. Call B&B Janitorial Services today!